As we continue through the food memories journey, it seemed right to think about Christmas, since it comes close on the heels of Thanksgiving. It's still a bit early to make Christmas cookies, although pfeffernusse (look below the Lane cake recipe) can be made this early to let the flavors blend. Still, making Christmas cookies with my Mom and decorating them with my siblings and leaving some for Santa on Christmas Eve (with a glass of milk) are all strong food memories. It's also a cherished memory from raising my own children. We started when they were young and my daughter and I still decorate cookie together each Christmas as time allows. I like to make rolled Gingerbread cut-outs. The classic Christmas cookie was a vanilla flavored rolled out sugar cookie that we cut with an assortment of cutters...there were stars with wavy edges, a sweet bell, a Santa in profile with a bundle of toys on his back, gingerbread boys and girls, snowmen and an angel. A round cutter could be used to make Christmas balls, which allowed for a lot of creativity in the decorations. In the early years I think that we used Royal icing and colored sugars and jimmies, and later the icing was tinted, too. In time I remember using some already made colored icing from the grocery store. I loved the gold and silver tinted tiny dragees because they added sparkle and shine...but were hard on teeth if bitten into. Not sure if they even make them anymore. To decorate a lot of sugar cookies with a Christmas theme in a short time, you can cut the shapes out of rolled dough and put them on the cookie sheets, then sprinkle red and green colored sugars at appropriate spots, press the sugar lightly into the cookies, then bake. When baked the colors will have spread out a bit, but there will still be that festive red and green look...no extra time needed for decorations, although to gild the lily you can still add more icing, sugar, jimmies, sprinkles, small candies, etc. 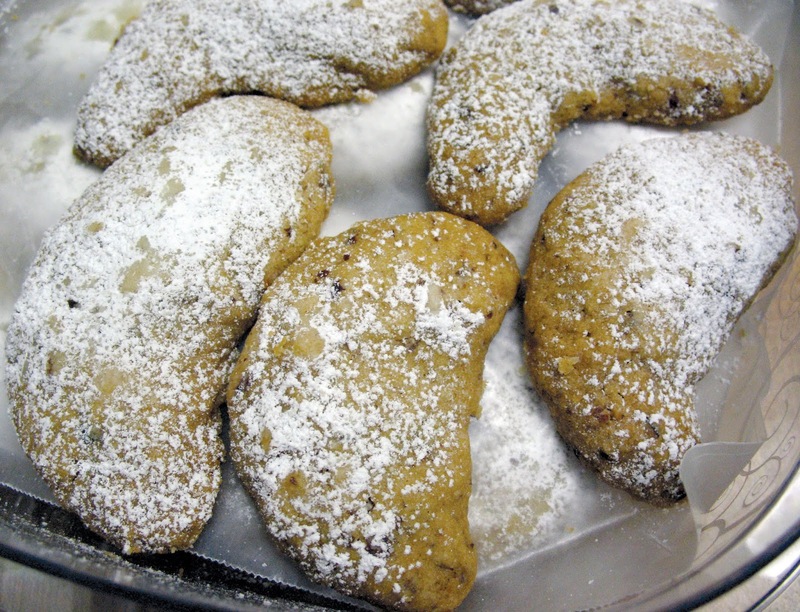 My favorite, and the cookie that continued to be baked by Mom well past her 80s, was the pecan crescent cookie. She would ship them all over the country for each of her children to share with their families. They had lots of butter and margarine and ground or finely chopped pecans and were shaped like a crescent moon. Baked cookies were rolled while still warm in some confectioners sugar or the sugar was sifted on top through a small tea strainer. 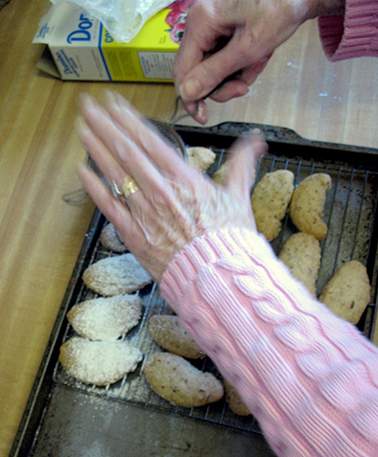 Here are photos I took of Mom's hands as she made a batch one year. Another family favorite was rum balls. You could start making this one pretty soon, too, since these little nuggets taste better when they have had time to ripen. Crushed vanilla wafers and finely chopped nuts and cocoa are the main ingredients, but there is real rum, too. By the time you eat them the alcohol has evaporated, so you get a nice rum flavor. These are another time-consuming hand-formed treat. Each little ball gets rolled in granulated sugar and them put in an airtight container for a few weeks so the flavors meld. 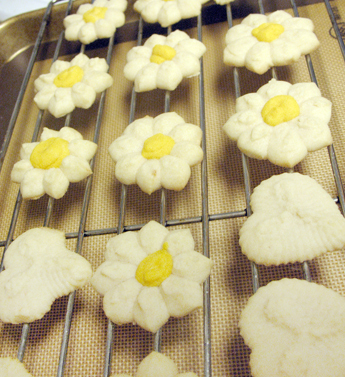 We also baked spritz cookies, the kind that you squish out with a cookie press. My favorite shape was the heart, followed by the dog. I also love the flower shape. You can either tint the dough or decorate with sprinkles or icing after they are baked. My daughter's favorite is Santa's Whiskers, a refrigerator cookie that has pecans and candied cherries, both red and green. The whiskers are shredded coconut, but we have skipped that part for quite a while, so I call them Shaven Santas. The lovely thing about them is that you can keep the dough log in the fridge and only bake a few at a time...perfect when unexpected guests show up at tea time. With butter or margarine at room temperature, beat in sugar and egg. Sift dry ingredients together and add to first mixture. Mix well. Roll dough to 1/8 inch thickness, cut with cookie cutters. Place on lightly buttered cookie sheets. Bake in a 4000 F. oven for 7- 8 minutes. If dough sticks while rolling, chill briefly. 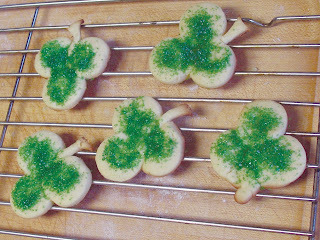 Cookies can be sprinkled with colored sugar before baking or, after cookies have cooled, can be frosted & decorated as desired. Makes 5 - 8 dozen cookies. Cream the butter until light. Add the rest of the ingredients except confectioners sugar, and mix thoroughly. Chill the dough. Shape dough into 1” x 3” crescents on a buttered baking sheet. Bake for 20 -25 minutes in a 3000 F. oven. Cool cookies on a baking rack. Roll cookies in confectioners sugar. Store in an air-tight container. Makes 4 dozen. MOM’S NOTES: Can sub ½ cup light butter or margarine. Combine the first four ingredients. Add syrup and rum. Mix thoroughly with clean hands. Shape into small balls and roll balls in confectioners sugar or super fine sugar. Store in air-tight container. Mellow for a week - then open and enjoy! Makes about 3 dozen balls. Preheat oven to 350 degrees F. In a bowl, beat the butter until creamy. Gradually add sugar and beat until light and fluffy. Mix in egg and vanilla and almond extracts. Add flour and salt mixing until smooth. 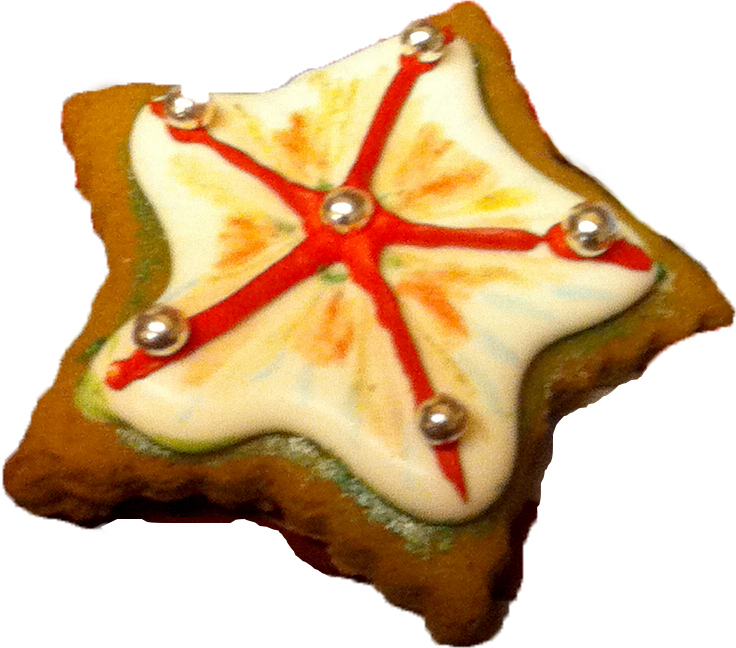 Pack dough into a cookies press fitted with a star or ridged tip or any desired design. Press out dough onto greased baking sheet. Bake for 8 to 10 minutes or until edge are lightly browned. 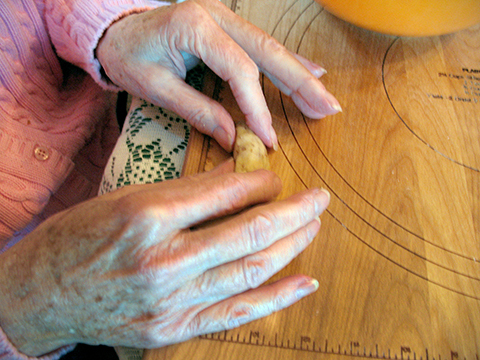 If a 1-inch wide ridged cutter is used, immediately cut strips crosswise on the diagonal to make 1 1/2 -inch-long cookies. Transfer to racks to cool. Makes about 6 dozen. Cream butter and sugar in a mixing bowl. Add almond extract and beat until creamy. Mix in the flour until well blended. Dough will be stiff. Spread cherries and pecans around top of batter. Stir in fruit and nuts. Mix well. Form dough into two logs on pieces of plastic wrap. Wrap well and refrigerate up to one week or freeze up to one month. Preheat oven to 350 degrees. Remove dough logs from fridge or freezer. If frozen let thaw a bit. With a serrated knife, cut crosswise into 1/4 inch thick discs. Bake on ungreased cookie sheets about 12 minutes or until edges are golden. Cool on rack. Makes 4 or 5 dozen. Note: To make as Santa's Whiskers roll logs in coconut before wrapping to refrigerate or freeze. Proceed as written with rest of recipe. Make sure not to burn coconut when baking. D. made 26 - yes, twenty-six - mini loaves of fruitcake, as well as four big loaves. There is no room in the fridge at all!!! I think the pfeffernusse next sounds like a plan...!